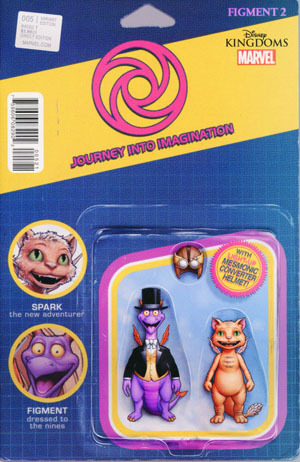 Figment 2 # 5 “The Legacy of Imagination Part Five: Big Dreams” by Jim Zub and Ramon Bachs brings the latest chapter of Figment and Dreamfinder to a conclusion. The Academy Scientifica-Ludicus is overrun by doubt thanks to Doubtfinder’s fear gas. And Doubtfinder is able to battle Dreamfinder by pointing out the fear and doubt in all of Dreamfinder’s dreams. Can Capri and Dreamfinder’s friends defeat the villain? And most of all can there be a payoff for the cover and its mosaic of imagination creations? The story does wrap up this chapter of Dreamfinder’s life, but Zub does not answer all questions and the next chapter is foreshadowed as Dreamfinder steps into his next adventure. I will admit I liked Figment a little better than the sequel. The prior story was more fantasy while this is more allegory and internal struggle to me. I worry that this struggle was lost at times on the Between Kid. But the Kid did ask to have me finish the tale and was eager to have it read. 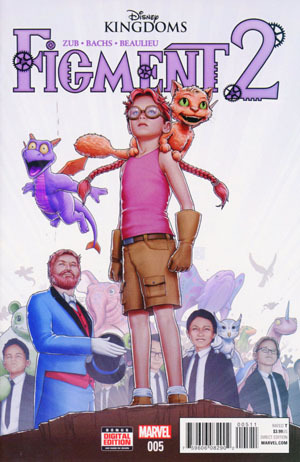 And while not my favorite overall arc I did enjoy Figment 2 and find myself hungry for the next edition. But the big question is will these adventures continue. The first issue for this series initially sold 20,551 copies according to the Comichron and debuted at 109. But with this final issue only 7, 291 issues were sold with a ranking at 202. I do feel some comfort that it was barely beaten by the 224th issue of G.I. Joe A Real American Hero while also beating out the very strong title X-O Manowar, a title I creatively enjoy. Basically this final single issue sales does not tell the full story since this ranking zone does have strong titles. But I do assume that much of the excitement over this title is direct single issue sales. But in the end it may be trades that get Dreamfinder to share his next chapter. On Amazon, the first trade is 235th amongst Marvel comics and Graphic Novels in sales. And with it being a title you can sell in the parks and other Disney locations…well I have hope. Because the story really does warrant a continuation of this Disney Kingdoms mainstay, so I hope. Figment 2 was a satisfying all ages story that the family enjoyed. And yes I want these titles to continue! They really do help me get my Disney fix as my visits to the park get further and further apart. And it amazes me the Between Kid loves Figment, despite never enjoying his Epcot attraction!